We love this tasty treat! It is light, sweet and fruity! This recipes makes quite a big bowl and it does keep for a few days. It is one of those recipes that you can find at every potluck because everyone really likes it! I try to make it often in the summertime because it is a cool dessert that I can make ahead. My aunt used to put different flavors of gelatin in this also to give it a different kick. 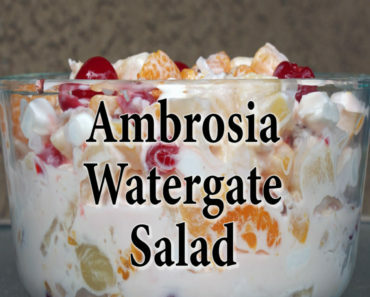 She would always ask who was going to bring this dish to a potluck. There a more variations of this one and you can always add different fruits. Just keep in mind that it can get watery so make sure you drain the can fruit completely! Mix pineapple, mandarin oranges, whipped topping, marshmallows, cherries, and coconut together in a bowl. Chill in refrigerator for 2 hours for flavors to blend.